This winter’s exceptional weather has deceived some popular springtime ornamental shrubs and fruit trees into flowering prematurely. 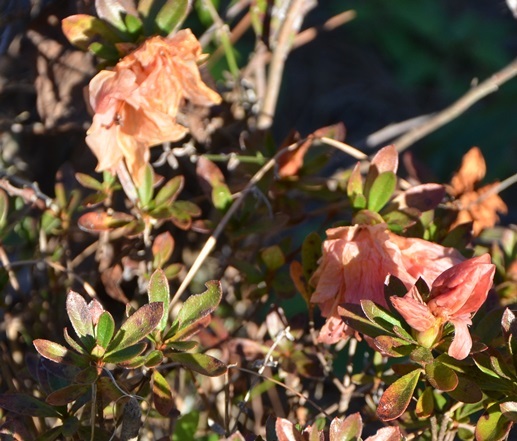 Azaleas, for example, began blooming because of winter temperatures mush warmer than average. There are number of variables which determine when a plant will bloom each year, including the sun, water, and air temperature. To understand why the plants bloom, there should be an understanding of “photoperiodism”, meaning the effects of light and darkness on some plant species. Certain plants respond to the day length. Some are long day plants which flower in spring and summer, and some are short day plants flowering in fall and winter. Then there are plants which will bloom in any season, identified as day neutral plants. Long and short day plants will not be directly affected by prevailing weather conditions. For example chrysanthemums, which are short day plant naturally bloom in winter. These plants can be forced to bloom in summer by keeping them in a dark room for 12 hours a day for several weeks. Many nurseries supplying florist uses this technique and utilize greenhouses with blackout systems. They also use grow lights to produce early season blooms on spring/summer flowers sold for Valentine Day. For those neutral day plants there is “vernalization”. 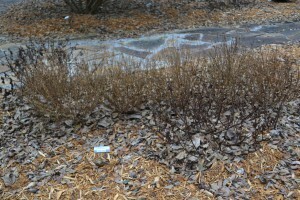 These plants must be exposed to cold weather to some greater or lesser amount. 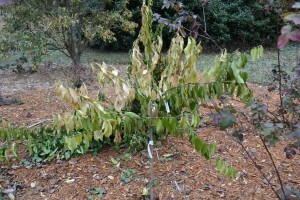 Most temperate fruit trees need exposure to cold temperatures. 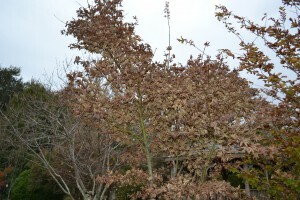 When winters are too mild or contain intermittent warmer periods, dormancy is prematurely terminated and bud break starts. Most of the exposed buds of these fruit trees can survive freezing temperatures, but many of their flowers will be killed if exposed to a late arriving hard freeze or frost. After the freeze most of the flowers may appear normal, but the center part of the flower where the reproductive organs reside are killed and result in no fruit formation. Covering plants in-bloom provides some freeze protection. With a warm early winter, like December 2016, there has been irregular and premature flowering. Another consideration is fruit trees or shrubs pruned too early winter. Warm weather combined with the pruning stimulates the growth of new shoots. 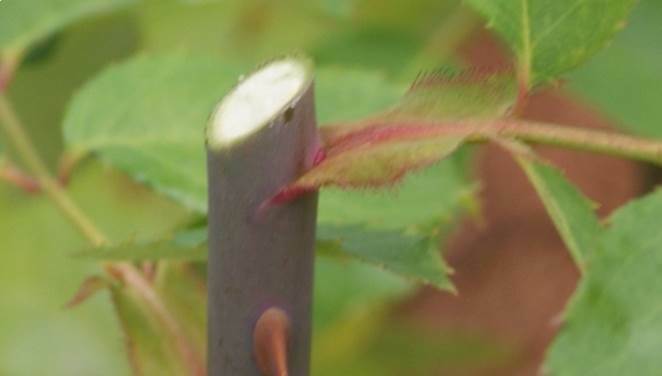 There is a hormone produced in lateral or terminal shoot buds which travels down the shoots inhibiting their growth. When the terminal shoots are pruned too early the growth inhibiting hormone is removed. 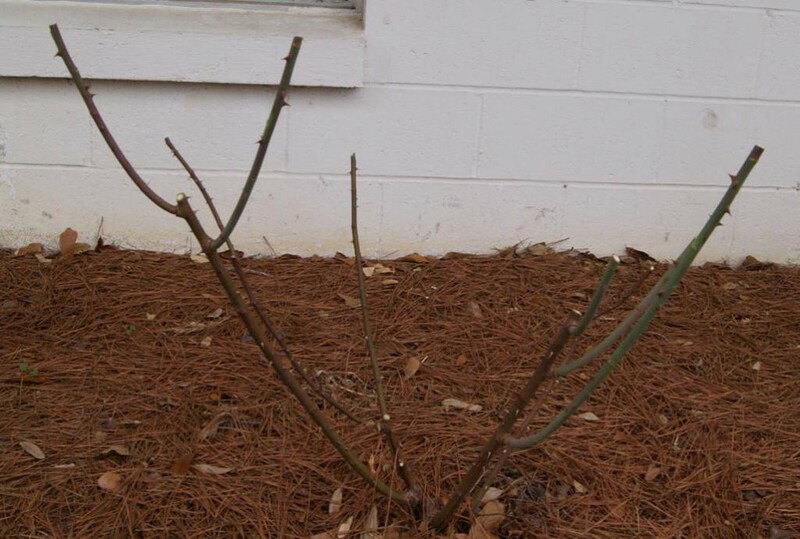 The warm days during winter may cause these newly pruned plants to form new shoots. The new growth is tender and very susceptible to freeze injuries. Pruning in late January or February will likely deliver the best results. For shrubs like azaleas and gardenias, flower buds are set in summer, long before they can be identified by most people. Losing the buds, no matter the cause, after midsummer drastically decreases the number of flowers the following spring. Our recent cold weather was not only a surprise for many locals but also for many plants that still had plenty of green growth. After a couple of nights of freezing temperatures, even deciduous trees that had not dropped their leaves, look a little ratty. Since it is just the beginning of December and we are likely to have many more days this winter with cold weather, now is not the time to react to plants that were damaged. 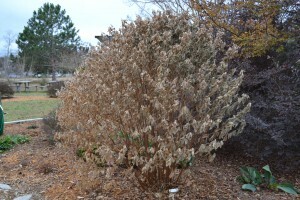 There are a few exceptions of plants that you can prune back, but in general patience is the key for the winter garden and cold-damaged plants. 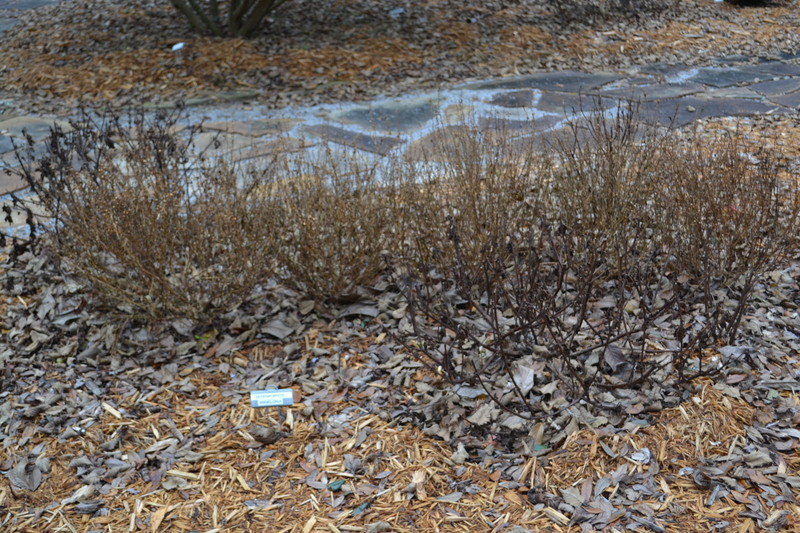 Unless planted in very protected spots, annuals like coleus and angelonia were killed by recent cold air. You may remove these plants or cut them back close to the group to make garden areas look neater. You may want to add some new winter annuals to brighten up these spots. Warm season annuals can be removed from the garden. 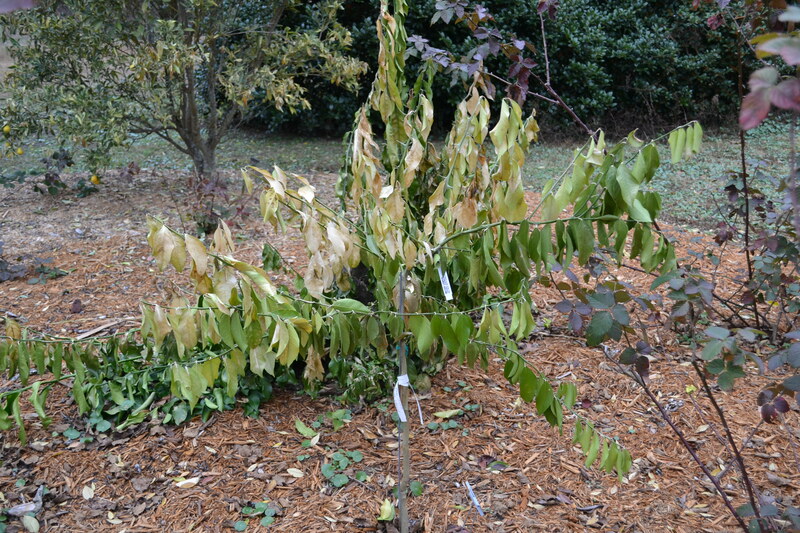 Both young and mature citrus trees experienced injury since many plants still had tender growth. Do not prune out any damage at this time. We will wait until next Spring to learn where the growth will resume and then prune as necessary to remove dead branches. The tender growth on a young Meyer lemon was damaged by cold air. As expected, the above ground portions of flowering perennials were severely injured by cold air. It is best not to prune these back now since the layer of branches and foliage may help insulate lower branches that could still have some life. If you are not able to tolerate the look of cold-damaged perennials in your garden, consider only pruning half of the plant just to make a neater appearance in the garden. When warm weather returns next year, we may be surprised to see growth resume on lower stems. Many flowering perennials like Tibouchina will return from the ground next year. Deciduous trees that would have normally dropped leaves before the cold have full canopies of dead leaves. Trees will eventually drop these leaves aided by winter winds and rainfall. This Japanese maple will eventually drop it’s cold-damaged leaves and offer attractive bark and structure in the winter garden. Considering it is the month of Valentine’s, roses are an appropriate subject to discuss. Not bouquets couriered to various locations all over town, but bushes in the landscape that have been strategically neglected over the winter. Now their time has come; pull on the gloves and get to work. February is the perfect time to prune rose bushes. Pruning is a step that is required to maintain healthy roses. 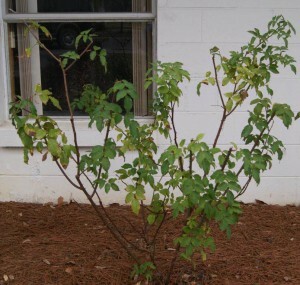 When roses are pruned, new growth is promoted by removing dead, broken or diseased canes. Pruning also allows the gardener to give their plant an attractive shape and encourage flowering, which is ultimately the reason roses are planted! Deciding which roses to prune will depend on their class. Hybrid tea, grandiflora and floribunda roses are repeat bloomers and need a moderate to heavy annual pruning this time of year. Some old-fashioned roses and climbers that bloom only once a year should be treated differently and pruned immediately after flowering. They set their buds on old wood from the previous year’s growth; therefore, pruning them would remove most of this year’s blooms. An exception to this would be dead, diseased or damaged wood on any rose bush or canes that are crossing and rubbing. This should be removed immediately upon notice. There are certain techniques that should be used when pruning any type of rose, no matter the time of year. Any pruning shear, saw or lopper you use should be sharp and sterile. Always wear protective gloves when dealing with roses, unless you don’t mind coming back bloody and mangled. Crown gall and canker can be spread between gardens and individual plants by dirty shears. To prevent the spread of disease, always disinfect pruning shears when beginning to prune with a 5-10% bleach or 20% rubbing alcohol solution, especiallly if they have been used in any other garden. If crown gall or canker has been found in one’s own garden, shears should be disinfected between each plant, no exception. This should also occur when bringing new plants into the garden, until they have been observed to be disease free. The first step when pruning any rose is to remove dead, damaged or weak stems leaving only the most vigorous, healthy canes. Try to cut the stems one inch below darkened areas, making sure to cut back to green wood. Always make your cut at a 45-degree angle; this will keep water from sitting on top of a stem and causing rot. When pruning try to open up the center of the rose bush. Pruning like this will increase air circulation and help prevent diseases. Since roses send out new growth from the bud just below a pruning cut, try to make pruning cuts above a leaf bud facing out from the center of the plant. Make your cut about ¼ inch above the bud and at the same angle as the bud. If any rubbing or crossing branches are noticed, the weakest of those branches should be removed. Deadheading, or removing spent flowers, can also be done at this time of year. When deadheading, remove the flower by making a cut just above the next five or seven-leaf branch down on the stem. This will allow for a strong and healthy cane to grow in its place. If no live buds remain, remove the entire cane. 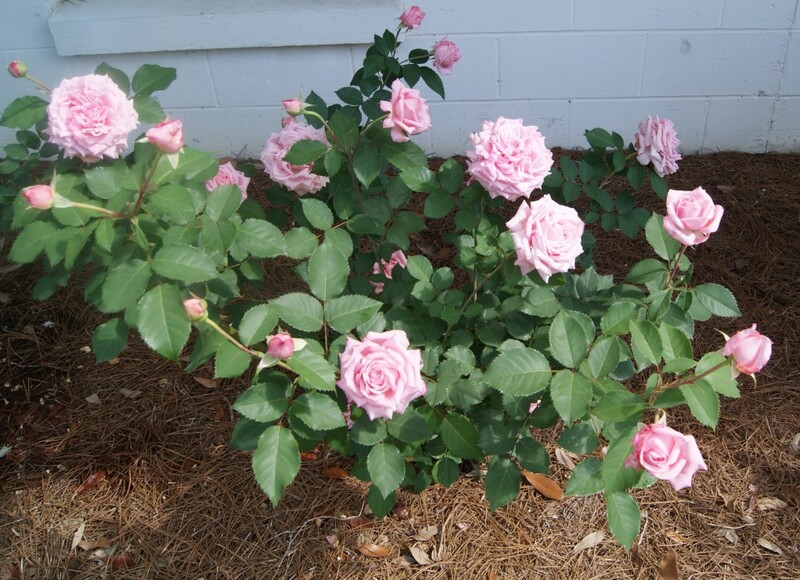 Modern reblooming roses (hybrid teas, floribundas, and grandifloras) should be pruned just as the buds begin to swell, which is around mid to late February. When practicing hard pruning, try to leave about four to eight large, healthy canes the diameter of your finger or larger on the shrub. For a more moderate approach, prune shrubs as discussed earlier and cut them back to about 12 to 24 inches from ground level. Generally, any cane thinner than a pencil should be removed. Don’t worry about pruning recently purchased new roses. Newly purchased roses have most likely been pruned, and no further cutting is necessary. Hopefully with the help of this article you can make a date to spend some quality time with your roses this season. The price of neglect is overgrown roses that are not nearly as attractive. In the Florida panhandle, we are fortunate to be able to grow crops throughout the year. The key is to know what to plant at the various times of the year. Vegetables that can be planted now include beets, broccoli, cabbage, carrots, cauliflower, Chinese cabbage, collards, kale, kohlrabi, lettuce, green onions, English peas, radish and turnips. For those that are started from seed, especially carrots and radish, sow seed every 2 to 3 weeks to stagger the harvest. During this cool time of the year, take stock of the vegetable garden area and decide if changes need to be made, such as moving or adding on to it. This is a good time of year to do the heavy labor before the warm, sweaty weather sets in. A popular choice is to add raised beds for growing herbs and vegetables. An advantage of a raised bed is that the garden starts with clean, rich soil that is weed and pest free. Grass and weeds do not have to be dug out for the garden; they can simply be covered by heavy groundcloth, newspaper or cardboard and the raised bed is placed on top. Stepping outside of the vegetable garden for a moment, for those interested in deciduous fruit such as peaches, pears and apples this is a great time to plant trees to give their roots time to develop before the warm, dry spring months. 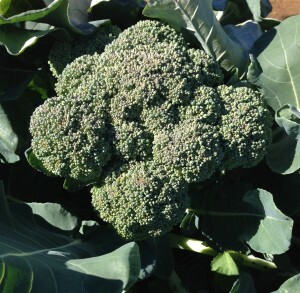 Be sure to select varieties that are proven performers for North Florida. Due to a lack of snow, Florida’s winter landscape chores are relatively uncomplicated. However, that doesn’t mean they’re unimportant. As the growing season comes to a close and gardeners mow, snip and spade for the final time, it’s time to consider proper cleaning and storage of all that equipment. A little preventative maintenance can avoid frustration and expensive repair in the future. When tools are maintained properly their life is extended substantially and their work efficiency is increased. A few examples of preventative care include cleaning and sanitizing, sharpening blades, and maintaining power equipment. When cleaning tools, remove caked on soil or vegetation using a wire brush, scraper or a strong stream of water. Sharpen hoes, pruners, loppers and saws. Always remember to check tools thoroughly for loose screws or nuts and tighten them accordingly. Spraying the bare metal parts and cutting edges of tools with a penetrating oil, such as WD-40, will help prevent rust. It is thought that wiping tools’ wooden handles with boiled linseed oil will help prevent wood from cracking and drying. Another item to consider while preparing one’s landscape for the winter is the garden hose. While hoses don’t need a great deal of care, a few small steps are important if they are to last. Store hoses on hose supports or reels or coil them loosely rather than hanging them on nails. Using hose supports or reels prevents the hose from sagging and kinking. Drain all the water and store in a dry location before storing hoses away for the winter. Power equipment, such as lawn mowers, may require additional winter preparations. Always refer to the owner’s manual for specific information. However, in general, the following steps can be taken to winterize this equipment. Remove collected grease, dirt and plant material from the equipment. It is always beneficial to check for loose screws and nuts and tighten them accordingly. Remember to sharpen cutting edges. If equipment has a four-cycle engine, change the oil by following instructions listed in the owner’s manual. Remove all gasoline from tank. It’s good to run the engine a turn or two to coat the cylinder walls with oil, and then replace the plug. Two-cycle engines, or engines that run with a gas and oil mixture, also should have the oil-gas mixture removed for the winter. Run the engine with the choke open to remove fuel from the lines. Check the spark plug and replace if it is worn. Replace other worn or damaged parts as well. Always avoid storing gasoline over the winter. Old gasoline does not ignite easily, making the machines using it work harder. Once the cold weather creeps in to Florida, gardeners may feel as if they can sit back and wait for spring, however, don’t neglect proper maintenance of garden tools. When the weather warms up, properly working garden equipment will be the gardens’ best asset! For more information feel free to contact your local Extension Office.